BZRK is a solid pre-workout for those who like a hard-hitting boost of energy before they workout. While some may look at the $50 price point and wonder, just know that even at ⅔-¾ servings work very well and still give you a great tasting, high-energy pre-workout that even delivers a nice pump. With the lifespan of pre-workouts being at an all-time low these days, BZRK is certainly worth giving some of your time and money to. It was certainly an enjoyable experience. 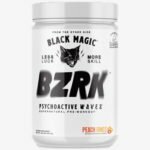 We reviewed Black Magic Supply BZRK on five categories. We first start by looking at its ingredient profile.  This portion of the review looks at the different ingredients used in the pre-workout supplement, what their intention is and how effectively dosed are each ingredient. Then we move into the taste of the different flavors we’ve tried. We grade each flavor separately and average the scores for their overall taste rating. We were able to test out the following flavors: Peach Rings. BZRK has two blends, and discloses the amount of pump ingredients, and one that is a proprietary blend of stimulants. We don’t mind the stimulant blend, as the caffeine amount is given to us and the isn’t the first ingredient in the blend here. So nothing here is really “underdosed”, as far as we can tell. The first 3 ingredients are Citrulline Malate (2:1) at 7 grams. It should be noted that Citrulline Malate is at a 2:1 ratio, meaning it has 4.7 grams of L-Citrulline and 2.3 grams of Malic Acid. BetaO is dosed at 3.2g. BetaO is a mix between Beta-Alanine and Orotic Acid. This is a solid dosage that has been shown to improve muscle endurance. Next up, we have 2.5 grams of GlyerPump™. This is good and slightly above the average 1-2 grams we see in many other products. Then comes Betaine Anhydrous, which is also at 2.5 grams. This is another solid dose. So as far as the “Supernatural Matrix” goes, it is good at every ingredient. So now comes the “Possessed Matrix”. This is in a proprietary blend. While of course we prefer to see open labels, a stim-blend isn’t really bad since it is what you feel, but we understand that some want this to be disclosed because they are stims which can increase blood pressure and heart rate. On that note, BZRK discloses the amount of caffeine, which SHOULD be disclosed anyway. The blend is 1,675mg total, and the first two ingredients are L-Tyrosine and Caffeine. We know that the caffeine amount is 350mg, which is on the higher side. Since Tyrosine is the first ingredient, it is going to make up most of the blend. Anywhere around 500mg-2000mg is fine, so it is most likely going to be above 500mg. The final ingredients are 2-aminoisoheptane (DMHA), Kola Nut Extract (4:1), N-Methyl Tyramine (NMT), Higenamine HCl, Neurofactor™, and lastly Huperzine A. DMHA is a stimulant that can produce energy and cognitive enhancement. We typically see this at 150mg. Kola Nut Extract produces caffeine and theobromine. There is no optimal dosage. N-Methyl Tyramine (NMT) is another stimulant known for weight loss. We have seen this dosed at high at 200mg. Higenamine is a fat loss ingredient typically dosed at 5omg. We highly recommend that you take a look at our Neurofactor™ page to get more detail on it, as it is certainly an interesting ingredient. We are big fans of Huperzine A as well. It prevents acetylcholine from being broken down in your brain, which may help you focus. Now of course we do not know exactly how much of each ingredient we get, but we attempted to reverse engineer this. If our math is correct, it apears that Neurofactor may be the only ingredient that doesn’t meet the recommended 100mg per the manufacture. 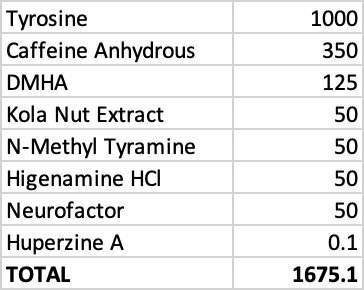 It appears N-Methyl Tyramine could be higher too but overall a solid stim blend in a well-dosed product. BZRK certainly isn’t a pre-workout for beginners. The main draw is the intense energy boost you get out of it. 30 minutes after you take it, you start to realize the ride that you are in for. It’s a mix of euphoria a simple urge to lift. The focus on getting your next set in was very noticeable. Even though our user just did a working set of 8 reps, he constantly said that after 10 seconds he felt as if he were ready for another set, it’s as if he had to force himself to take time between sets. One scoop may be too much for many in all honesty. With 350mg of caffeine along with DMHA, if there is one person saying that this doesn’t hit them hard or at least provide a nice boost, that person probably just needs to take a break off of stims for a few weeks and rethink their pre-workout habits. Obviously, there is no way to tell how much DMHA is really in BZRK. Judging by the feeling however, it is more than enough. That may be why even at ¾ of a serving still provides a nice jump in energy, or even at ⅔ of a serving. The combination of DMHA and caffeine work well, and BZRK is a great example of this. As for the pump, it’s there as well. 7 grams of Citrulline malate is certainly going to get the job done for many of us. While it may not be like taking a high dose of an amino-bound nitrate, it is still provides a nice enough effect to make chest and arm days fun. Rarely does a pre-workout really keep me coming back due to flavor. With so many good tasting ones on the market, I find myself getting bored of one simple flavor after 4-5 tries. BZRK Peach Rings is just different and keeps me coming back every time. Whether I water it down or mix it with 8oz of water, it seems to taste the same and I actually enjoy it. It mixes great and isn’t too heavy on dyes. While it isn’t “see-through”, it doesn’t look like a glass full of highlighter juice. The sediment that is in here is very fine and you have to look closely to see it, but you won’t notice it at all as you drink it. Some may settle to the bottom, but a light swish of your shaker cup or glass takes care of it easily. As mentioned in the ingredients section of this review, they used a high-quality Glycerol Monostearate, which is probably what it you may see settling, but it doesn’t seem to make the drink super chalky like some other pre-workouts do. You can get this for $50 from Suppz. For 25-servings, it’s not bad overall. In all honesty, most people using this will not need a full serving, especially due to how strong the energy portion of this is. Since the Beta-Alanine, GlycerPump, and Citrulline malate are all at solid doses, as well as the stim blend looking solid, we have little to complain about here. So this could easily last you 40+ servings, as even at ⅔ of a serving you will still get a solid pump and great boost in energy. So while we won’t rate the overall value on 40+ servings, it would easily be above a “9” if we did, so take that into consideration if you’re reading this.